Philadelphia Water Dept. Commissioner Debra A. McCarty, Hestonville Civic Association President Sheila Buchanan, Fourth District Councilman Curtis Jones Jr., Deborah Cahill, design and construction project manager at the Dept. 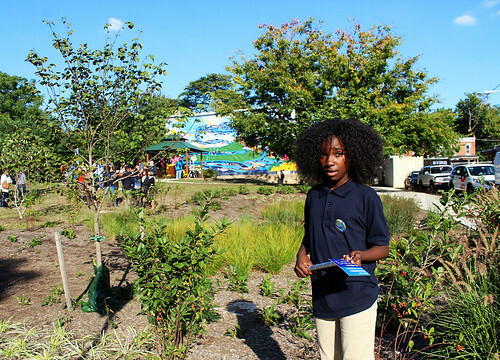 of Public Property, artists Eurhi Jones and Michael E. Reali, Philadelphia Mural Arts COO Joan Reilly and Pa. State Rep Morgan Cephas, of the 192nd District, joined West Philadelphia residents in welcoming a new rain garden and mural at a formerly vacant lot. Located at 55th and Hunter streets, the site is now a vibrant green space open to the community and also features a new fence and gazebo. The mural, whose title, “Your Hands Shimmering on the Legs of Rain,” is borrowed from a haiku by local poet Sonia Sanchez, features the Schuylkill River, local streets, and aquatic wildlife like shad and otters. In addition to the partners at the dedication, the project was made possible with funding from the Environmental Protection Agency and the support of the Pennsylvania Horticultural Society, which has maintained the lot with residents. Philadelphia Parks and Recreation also worked with PWD to create improvements at an adjacent site.